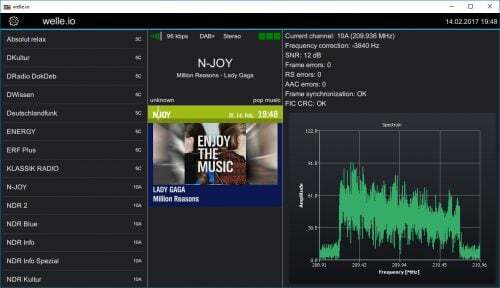 There are now dozens of software defined radio packages that support the ultra cheap RTL-SDR. On this page we will attempt to list, categorize and provide a brief overview of each software program. We categorize the programs into general purpose software, single purpose software, research software and software compatible with audio piping. If you know of a program that is missing please leave a comment in the comments section at the bottom of the page. 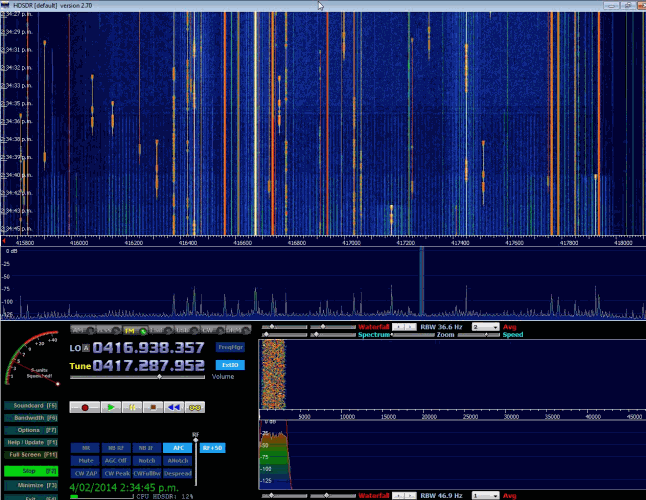 13/02/2014 - Added Sodira, gr-wmbus, rtlsdr-waterfall, QTRadio, multimon, sdrangelove, lte-scanner, rtl_tcp, rtl_sdr_FS20_decoder. 17/02/2014 - Updated the Linrad description. 28/04/2014 - Added Modesdeco and Trunk88. 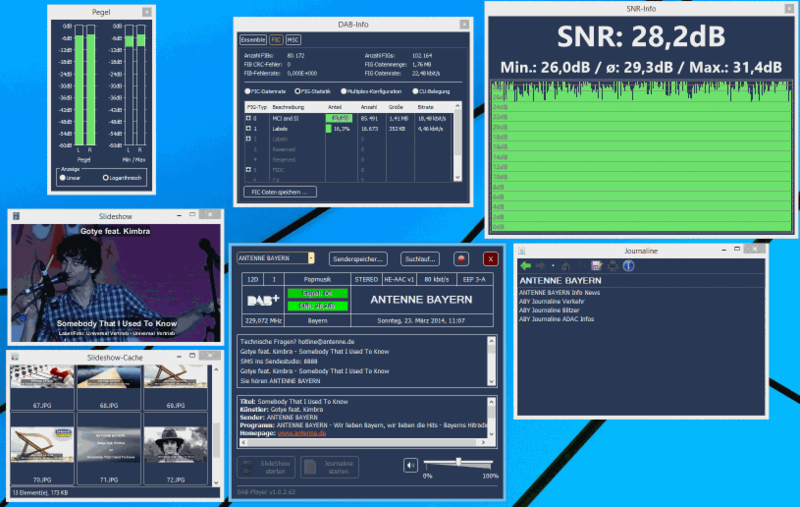 30/05/2014 - Added RTL Panorama, RTL SDR Panoramic Spectrum Analyzer, Chrome Radio Receiver, SeeDeR, DAB Player, RTL SDR Installer, PD/Max Wrapper, SDRWeather, LTR Analyzer, softEOT/softDPU and ScanEyes. 26/07/2014 - Added PiAware, OOK-Decoder, rtl_fm_python, rtl_power heatmap viewer, RTL Bridge, threejs-spectrum, CANFI Software, PNAIS, FLARM Decoder, Xastir, RTLSDR-Airband, SDRTrunk. 13/11/2014 - Added Touchstone, RFAnalyzer, RTL1090 XHSI Interface, Parus Decoder, PlotRTL1090, LRPT Decoder. 05/02/2015 - Added rtl_tool_kit, CubicSDR, OregonWeather, FreqWatch. 15/04/2015 - Added ADSBox, YouSDR, FlightAware Flight Feeder, Frequensea, Track your flight EUROPE, QSpectrumAnalyzer, Doppler & Demod, Redsea, rtl_heatmap, gr-gsm, driveby, SDRecord. 23/12/2015 - Added Remote rtl_udp, AISRec, dump978, AISDeco2, SDRrecorder, OpenWebRX, dsame, RTL-Widespectrum, rtl_ais, rtl_gopow, ham2mon, rtl_ais_android, inmarsatdecoder, spektrum, qtcsdr, rtl_power_fftw, JAERO, GNSS-SDRLIB, SVxLink. 8/09/2017 - Added inspectrum, gr-isdbt, telive, tetra-listener, gr-iridium, SDRuno, luaradio, rx_tools, kukuruku, chronolapse, cloud-sdr, natpos, d3-waterfall, SDRDue, gqrx-ghostbox, ships, rtlmic, tsl-sdr, universal radio hacker, dumpvdl2, re-dected, aerial-tv, questasdr, welle.io, spyserver, dspectrumgui, atcsmonitor, NRSC5 HD Radio Decoder, leandvb, imsi-catcher, block stream receiver, salamandra, deinvert, RS. We define general purpose SDR software as programs that allow the RTL-SDR to work like a normal wideband radio receiver. 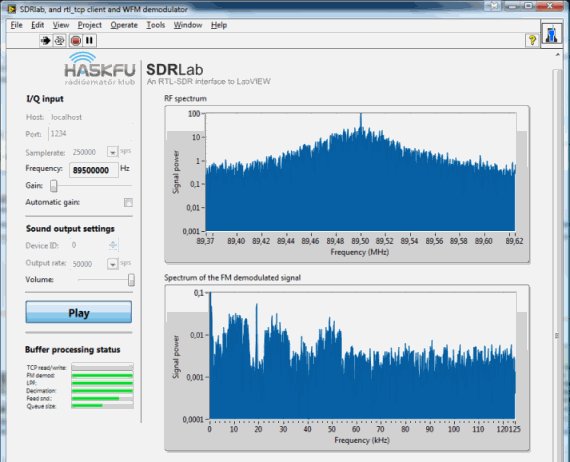 SDR# (pronounced "SDR Sharp") is the most popular free RTL-SDR compatible software in use at the moment. It is relatively simple to use compared to other SDR software and has a simple set up procedure. We have a full overview of the installation procedure on our Quick Start Page. SDR# is designed to be use with the $199 Airspy SDR, but works just fine with the RTL-SDR. SDR# is a simple to use program that also has some advanced features. It has a useful modular plugin type architecture, and many plugins have already been developed by third party developers. 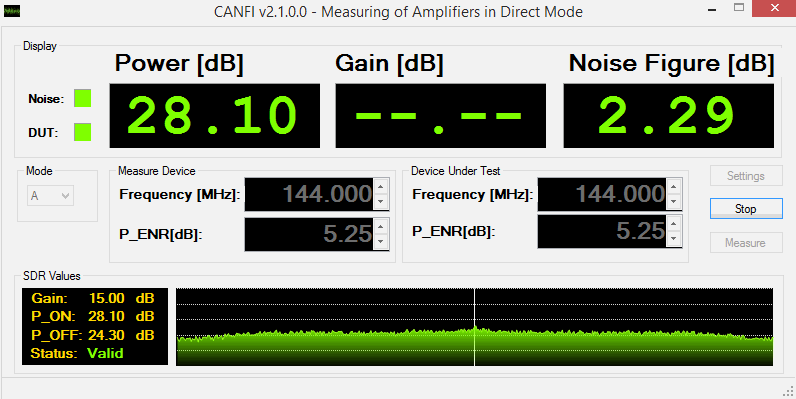 The basic SDR# download without any third party plugins includes a standard FFT display and waterfall, a frequency manager, recording plugin and a digital noise reduction plugin. SDR# also decodes RDS signals from broadcast FM. 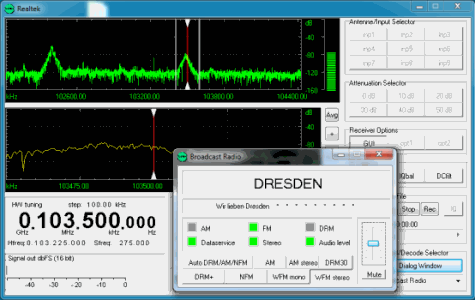 HDSDR is based on the old WinRAD SDR program. HDSDR supports the RTL-SDR through use of an ExtIO.dll module. To install HDSDR, download the program from the link on the main HDSDR page, then to use the RTL-SDR you will need to download the ExtIO_RTL2832.dll file an place it into the HDSDR folder. When opening HDSDR, select the newly copied ExtIO_RTL2832.dll. The other dlls that come with HDSDR will not work with the RTL-SDR, even though they have RTL-SDR in their filename. The official installation instructions can be found here. Along with a FFT display and waterfall, HDSDR has some extra advanced features. Users will also find an Audio FFT and waterfall display on the bottom of the screen. The output audio can also be bandpass filtered by dragging the filter borders on the display. 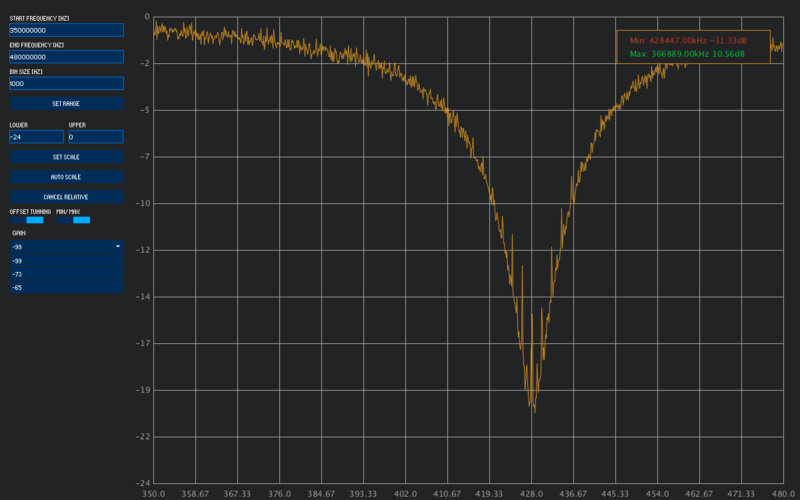 Bandpass filtering the audio can really help clean up a noisy signal. The audio processing also supports placing of notch filters either manually or automatically. There are also noise reduction and noise blanker features and an automatic frequency centering algorithm which will automatically center the signal, so you don't need to click exactly in the center of a signal. Traditional ham radio users will also enjoy the S-units signal strength meter and the built in frequency manager. 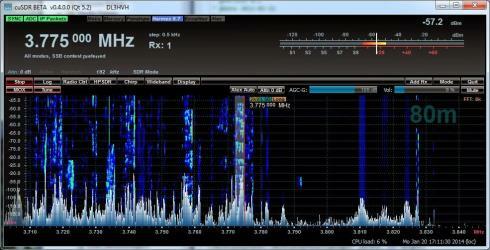 SDR-RADIO.COM V2 and the newer V3 is a popular SDR program with many advanced features. As such is it a fair amount more difficult to learn and use compared to SDR# and HDSDR. Be sure you install version 2 and not V1.5 as only V2 has RTL-SDR support. Once sdr-radio is installed, to get it working with the RTL-SDR you will need to compile or download three .dll files (SDRSourceRTL2832U.dll, rtlsdr.dll and libusb-1.0.dll) and place them into the sdr-radio folder. To compile your own dlls see the instructions here, otherwise download the dlls directly from the bottom of this link. If the dlls were placed in the correct folder you will be able to add your RTL-SDR as a receiver by clicking on the +Definitions button, and then finding and adding the RTL SDR (USB) option under the search drop down menu. Like HDSDR, not only does sdr-radio have a RF FFT signal and waterfall display, but also an optional audio spectrum FFT and waterfall display. Built in are also several DSP features like a noise blanker, noise reduction filter, notch filter and squelch options. The EMNS noise reduction filter is particularly good at automatically cleaning up and clarifying voice signals. To add to the feature list, sdr-radio also has built in PSK, RTTY and RDS decoders, and also comes with a satellite tracker. Furthermore, sdr-radio V2 (not V3 yet) has an excellent remote server which will allow you to easily set up and connect to a remote RTL-SDR server over a network or the internet. 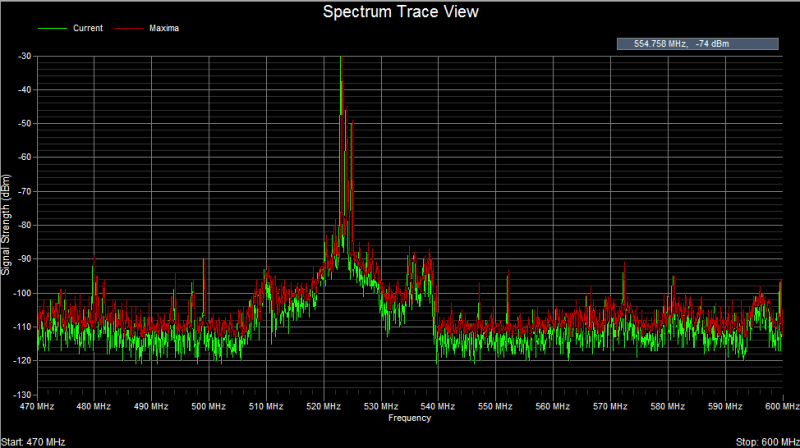 Finally, sdr-radio is capable of listening to up to 6 signals in the same chunk of visible spectrum at a time. Linrad is a free advanced SDR program with a steeper learning curve compared to most other SDR programs. 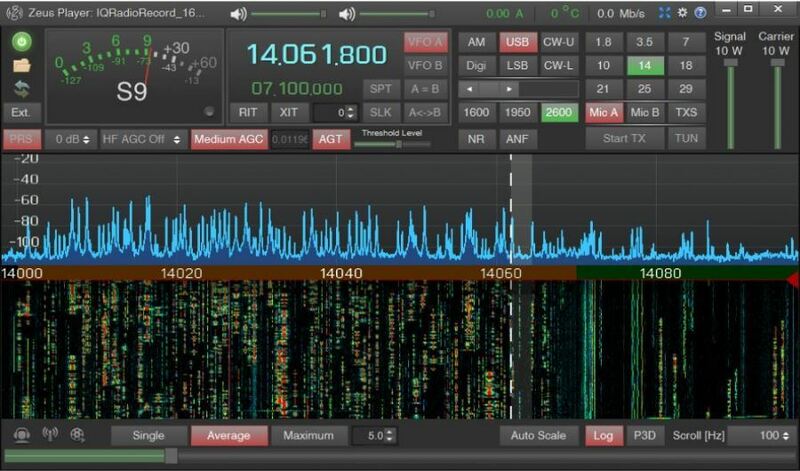 Many users prefer to use Linrad as it can be set up to have a very high amount of information density on the screen and it also has an advantage with receiving signals with the E4000 tuner as it can be made it run in a special linearity mode which significantly improves the dynamic range. Linrad also has some very advanced features not found in most other SDR receivers. It has multi-frequency interval I/Q correction, a very powerful "smart" noise blanker, multicast output, weak signal optimized waterfall, settings to aid in taking performance measurements, two RF channel input, superior AGC and an adaptable automatic frequency controller (AFC). Linrad is probably the software most superior in terms of actual signal processing performance. To install Linrad on Windows first download and run the setup-dll installer, and then download and extract the actual Linrad program. You will need to go through a text based set up at the very beginning. 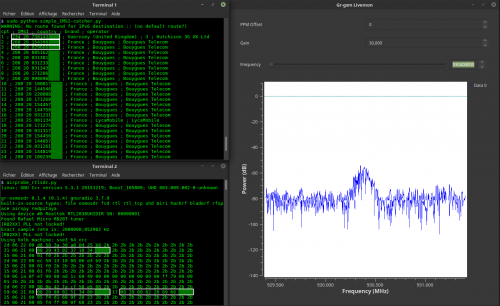 GQRX is a free simple to use SDR receiver which runs on Linux and Mac systems. It is similar to SDR# in terms of features and simplicity of use. GQRX comes with a standard FFT spectrum and waterfall display and a number of common filter settings. A new cross platform SDR receiver which is based on the liquid-dsp libraries. 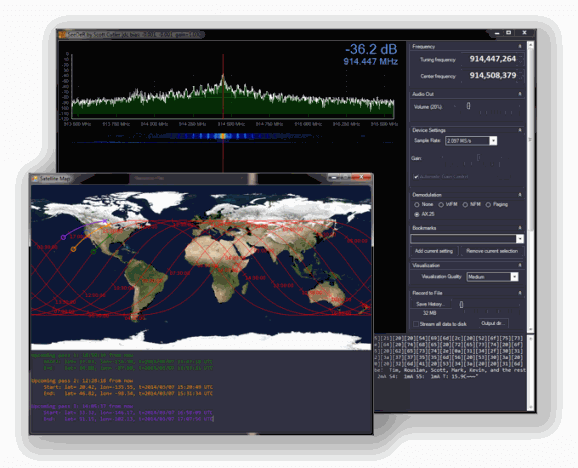 Studio1 is a non-free commercial SDR receiver with advanced DSP capabilities, and is claimed to have the lowest CPU usage of any general purpose SDR software. Studio1 supports the RTL-SDR through use of an ExtIO.dll module. Studio1's claims that it has a very efficient DSP engine that can run well on older Pentium 4 machines. SDRplay have now acquired the rights to Studio1 and have released a free version of it called SDRUno. SDRUno is designed mostly for use with their SDRplay units, but they have also added compatibility with RTL-SDR units, up to a maximum bandwidth of 2 MHz. It is essentially the same as Studio1. A fairly feature rich piece of software, although the interface can be a bit clunky and difficult to use at times. 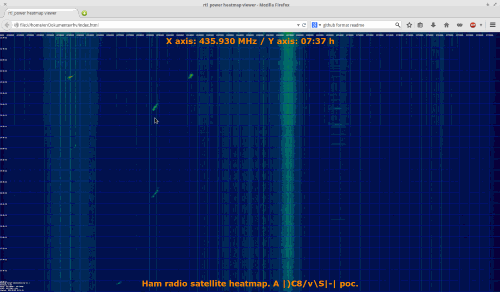 ShinySDR is an SDR application built in GNU Radio with a web based interface. Since ShinySDR is controlled via a web interface it can easily be controlled over a network or the internet. It also has a plugin type development feature which allows demodulators to be easily written and integrated. The current main technical advantage to ShinySDR is that it has a persistent waterfall, meaning that the waterfall can be moved, zoomed and re-tuned without loss of any history like in other SDR software. 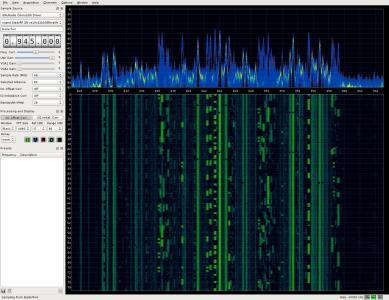 WebRadio is a Linux based application that is attempting to build an open source system for the RTL-SDR and other software defined radios similar to the closed source WebSDR . 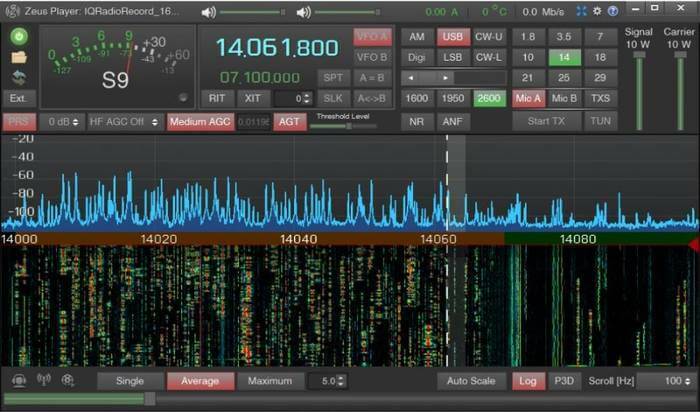 The WebSDR system allows for multiple public users to connect to a radio over the internet and tune to various frequencies. WebRadio is currently functional but still under development. A web based server and interface for remotely accessing RTL-SDRs. Seems to be more developed and active than WebRadio. 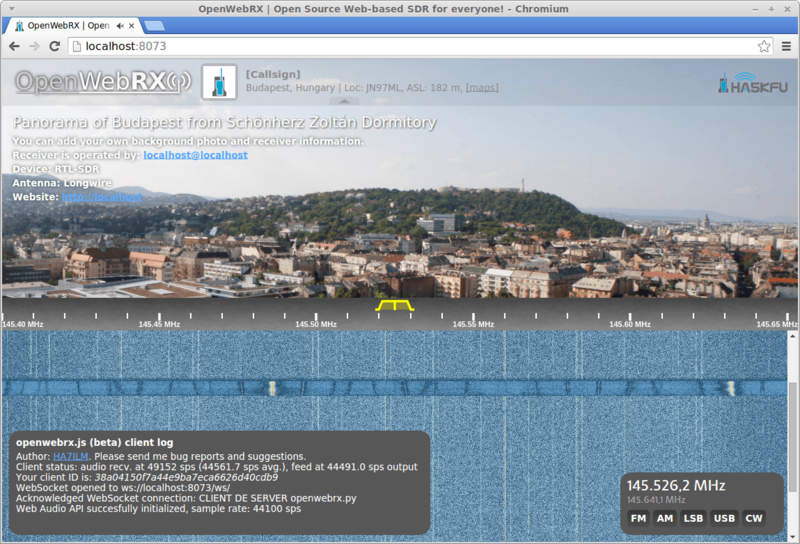 There is an active list of OpenWebRX receivers listed at sdr.hu. 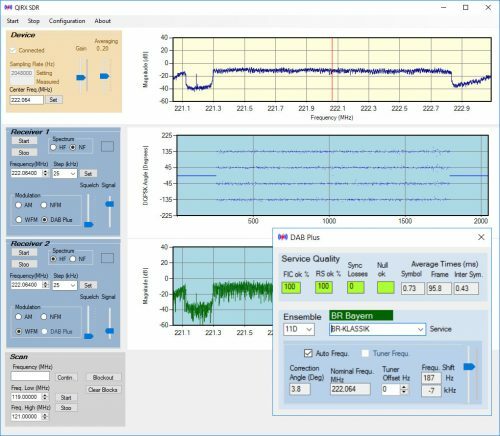 Sodira is a Windows application that is capable of decoding AM and FM+RDS radio as well as DRM/DRM+ and time signals DCF77/HBG. It supports the use of the RTL-SDR through use of the ExtIO_RTL2832.dll module. The same ExtIO_RTL2832.dll module that is used with HDSDR and whose download is linked to in this HDSDR tutorial can be used with Sodira. Just place the dll in the same folder as Sodira, and then under Configuration->Receiver select the dll file and then click on HW Init + Start to activate the RTL-SDR. 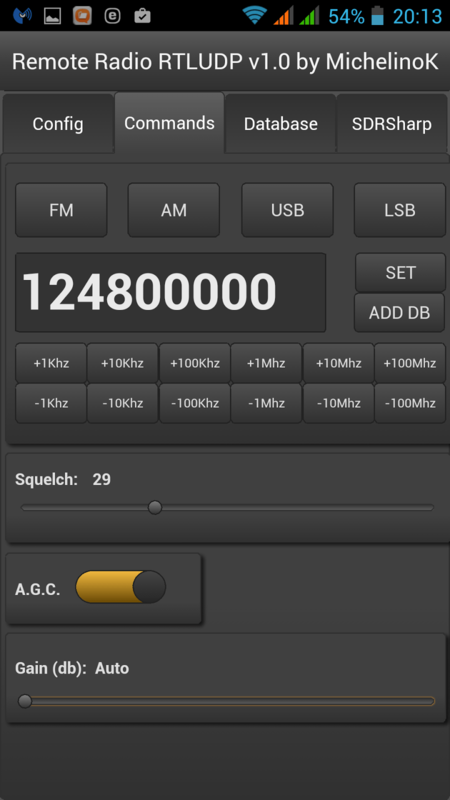 SDRTouch was the first Android based RTL-SDR software receiver available. There is a free restricted trial version and the full version can be bought from the Google Play store. 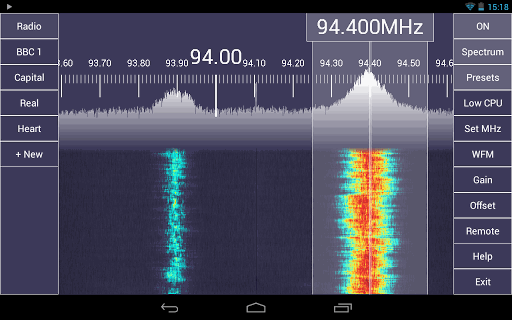 To run SDR Touch you need a modern Android 4.0+ device with decent processing power and USB OTG support. You will also need a USB OTG cable to connect to the Android device to an RTL-SDR dongle. SDR Touch has several standard features such as FFT spectrum and waterfall displays, WFM/FM/AM/SSB tuning and a frequency manager. 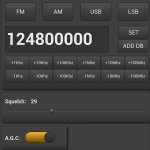 Wavesink Plus is another Android based RTL-SDR receiver with a free trial and paid full version. Wavesinks main feature is that it is capable of decoding DAB+ and DRM+ digital radio signals. As well as the digital radio signals, it can also receive standard FM and do FM-RDS decoding as well. To use Wavesink, like SDR Touch you will need a decently powerful Android 4.0+ device with USB OTG cable. Android app similar to SDR Touch. Originally for the HackRF, but now also supports the RTL-SDR. Still under heavy development. Available for a small price on the Google Play store, or for free from the GitHub. An SDR receiver intended for use with the HPSDR project SDR hardware, but can be used with the RTL-SDR through use of the RTL_HPSDR translation server program. One advantage to cuSDR is that it can support up to seven simultaneous RTL-SDR dongles. cuSDR is still currently under development. PowerSDR is an SDR receiver intended for use with the FlexRadio SDR hardware. It is compatible with the RTL-SDR through use of the RTL_HPSDR translation server program. PowerSDR is capable of supporting up to four simultaneous RTL-SDR dongles. QtRadio is an open source SDR receiver that is based on a client-server architecture from the ground up. It is designed so that multiple clients can connect to a single server. QtRadio comes with a special RTL-SDR server which you will need to download and run. A simple GNU Radio based "multi mode" receiver which can receive AM, FM, SSB, WFM, and TV-FM. Sdrangelove is an SDR receiver primarily designed for the OsmoSDR hardware but also supports the RTL-SDR. Kukuruku running and demodulating TETRA audio with a plugin. A browser based SDR client. Is efficient because it only sends the filtered narrowband channels and the waterfall pixels instead of the entire IQ data. Has some other intteresting features too like multiple demodulators, history browsing, pluggable demodulators, improved squelch, histogram, autotune and scanning features. It seems that the server is Python based and the server runs on Linux. Another RTL-SDR compatible general purpose receiver program and this one runs via an rtl_tcp connection. Mostly seems to be a proof of concept. Have some interesting features though, like waterfall history replay. Another simple multi-mode general purpose receiver. Previously known as UnoSDR (not to be confused with SDRUno). A simple C# based multimode decoder. One interesting feature is that is contains a built in DAB+ demodulator. A general purpose receiver like the others, but has transmit capabilities to for capable radios. Works with various radios like the ZS-1, Hermes, HIQSDR, Odysset, as well as ExtIO radios like the RTL-SDR. Is one of the few paid options, and costs 2000 RUR (~32 USD) for the RX only version, and 6000 RUR (~96 USD) for the version with transmit capabilities. The trial version allows you to use the software for 10 minutes at a time. 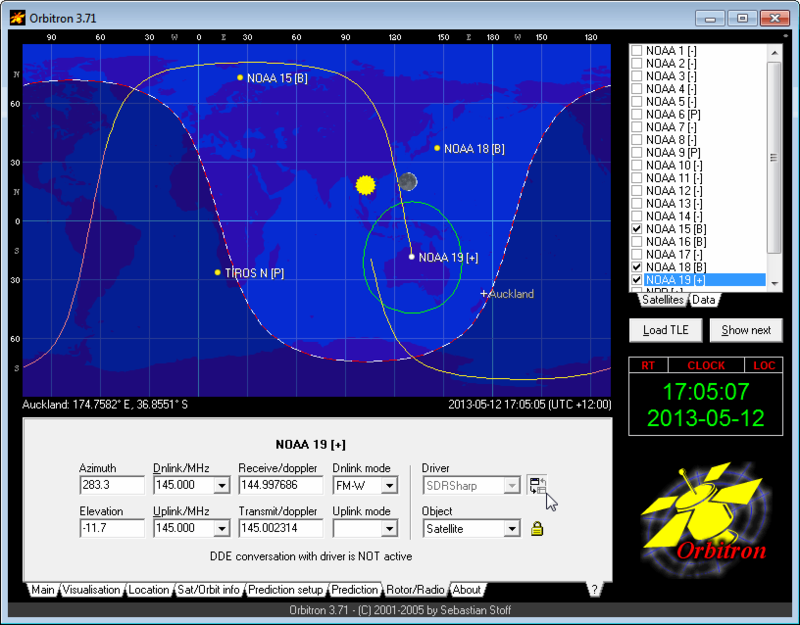 SeeDer is a general purpose SDR GUI that has a focus on decoding data from satellites. Legality Note: SeeDeR may be an illegal clone of SDR#. If this is proven in the future we will remove links to SeeDeR on our site. Here we list single purpose RTL-SDR supported software. By single purpose we mean an application that decodes a single protocol, or performs a single function. RTL_FM is a command line based FM receiver for the RTL-SDR which is bundled in the official RTL-SDR release. It is extremely useful in Linux as it can be used to pipe decoded FM audio to decoder software. SoftFM is a command line FM receiver for the RTL-SDR that is similar to RTL_FM. The difference is that SoftFM claims to get much better audio results compared to RTL_FM. RTL_UDP is a modification of RTL_FM which allows FM audio to be broadcast over a network or the internet via UDP. Allows you to control a rtl_udp server via an Android app. 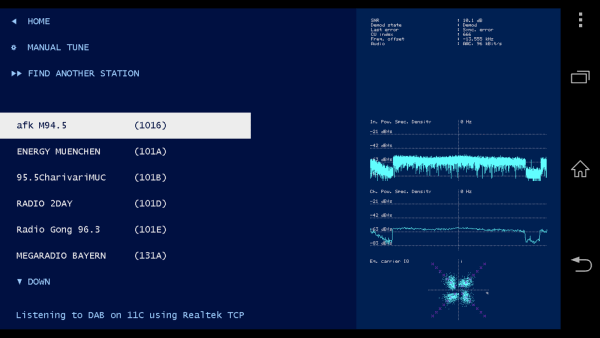 RTL_TCP is used to stream IQ data from the RTL-SDR over a TCP network. Many programs can connect to this, for example in SDR# there is the RTL-SDR/TCP option. An efficient alternative to rtl_tcp. Designed for the Airspy, but also made compatible with the RTL-SDR. Unlike rtl_tcp which streams the entire IQ bandwidth, SpyServer only streams the IQ data of the currently selected IF bandwidth in SDR#. The waterfall is compressed and sent as efficient data as well. The only downsides are that it only works with SDR# at the moment, and the server needs more powerful computing hardware as the computations are all performed server side. A Python program based on rtl_fm that allows you to tune to any station using a web interface. 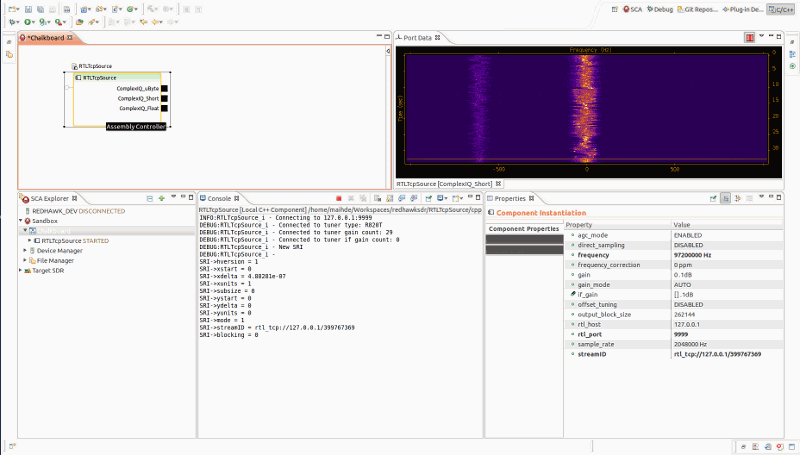 An SDR independent implementation of rtl_fm/rtl_power etc. Uses the SoapySDR abstraction layer. 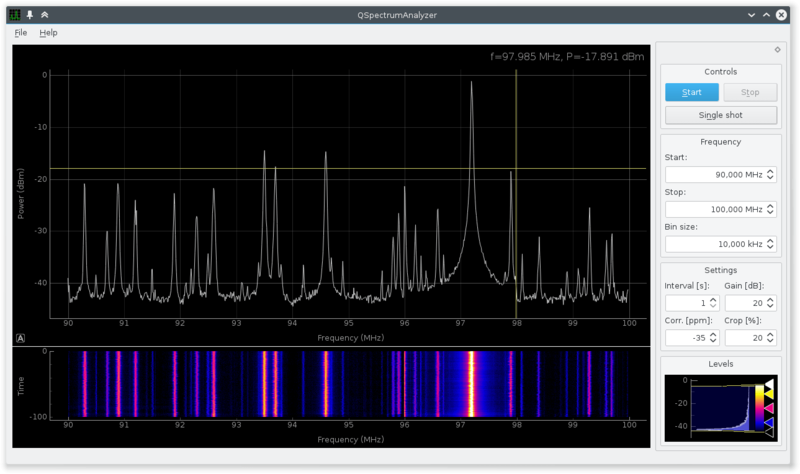 RTLSDR Scanner is a simple cross platform python based wideband spectrum analyzer for the RTL-SDR. It can scan an arbitrarily large frequency bandwidth. The scanner also has an auto calibration feature which can help find the PPM offset of a dongle. Newer versions also have a GPS feature, which allows you to interface a hardware GPS receiver to the software and do signal mapping experiments. Similar to the RTLSDR scanner but written in the basic for gambas programming language. Essentially a front end for rtl_power. Another wideband RTL-SDR scanner but based on the command line software rtl_power. Essentially a GUI interface for rtl_power. 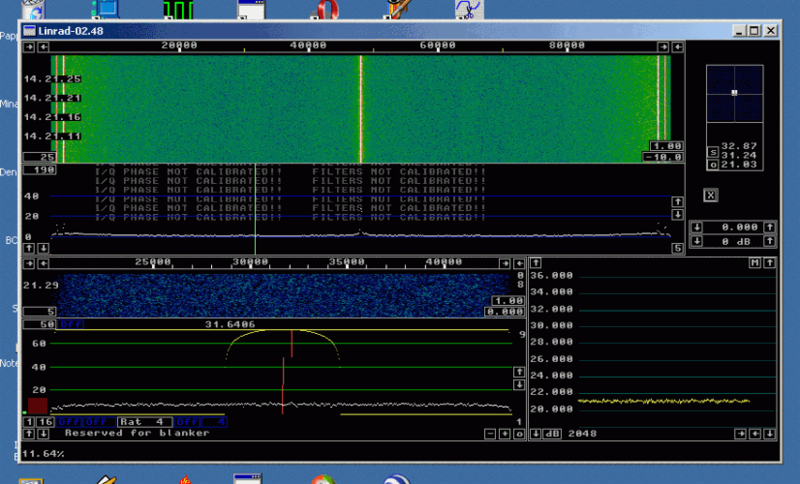 Scans much faster compared to RTLSDR Scanner. Another interface to rtl_power, but this one has a special relative mode that allows you to make easy SWR and filter measurtements with a noise source. Another GUI interface for rtl_power. Similar in function to RTL Panorama. SDR-J is a free program that is split into two different programs. 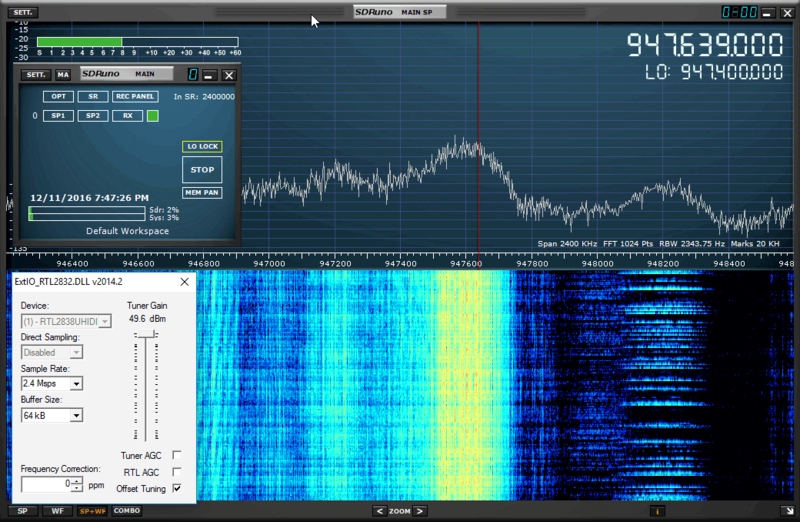 There is the SDR-J DAB/DAB+ receiver program and the SDR-J FM decoder program. The DAB decoder is the most popular of the two. To install the SDR-J DAB receiver go to the SDR-J website and download the dabstick-radio.zip file, unzip it and run dabreceiver.exe. 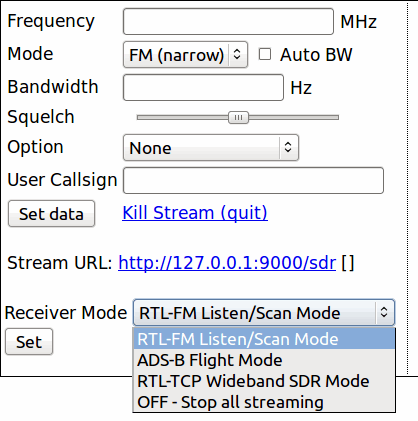 If your RTL-SDR is plugged in you'll be able to click the start button and begin choosing the DAB band in your country using the left drop down box. 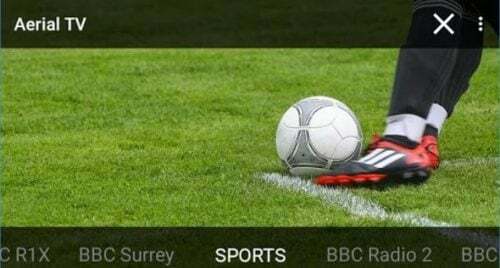 DAB Player is software for listening to DAB radio. It requires use of the official manufacturer RTL2832U drivers. Welle.io DAB/DAB+ decoder for the RTL-SDR and Airspy. Another DAB/DAB+ decoder, but one with a very nice and professional looking interface. 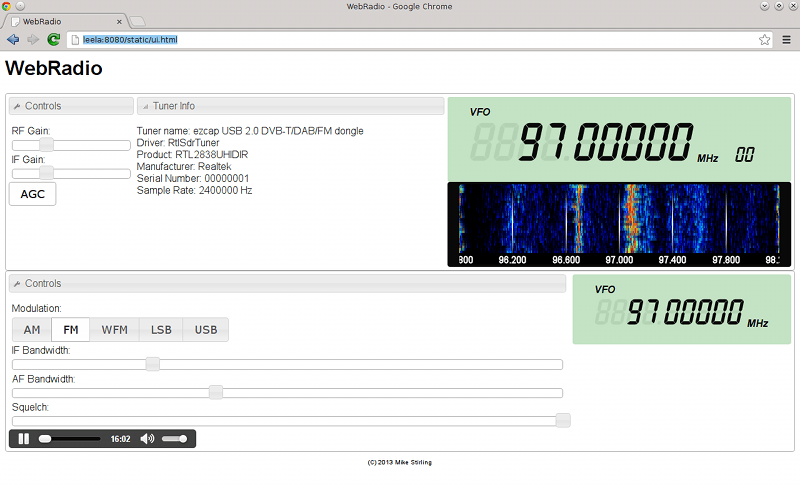 An RTL-SDR WBFM receiver app for Chrome. Runs in the Chrome browser and works on Chrome Books too. 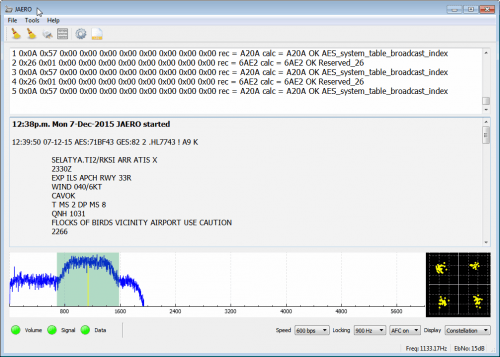 ADSB# is a Windows Mode S ADS-B decoder for the RTL-SDR written by the author of SDR#. Use this program to broadcast data via TCP/IP locally via TCP to a graphical radar program such as Virtual Radar Server, Planeplotter or adsbSCOPE. 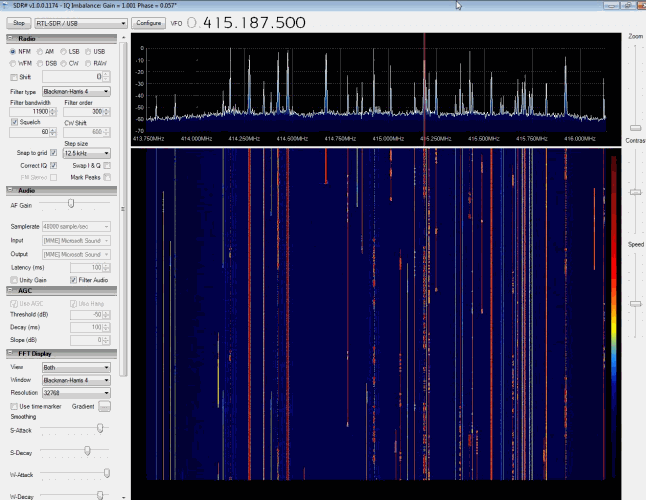 RTL1090 is another Windows Mode S ADS-B decoder for the RTL-SDR. As with ADSB# you need to use this program to broadcast data via TCP/IP to a graphical radar program. The latest installation program known as the RTL1090 IMU simplifies the installation by automatically downloading some required .dll files. The current series 2 beta version aims to improve decoding and also has a built in radar display. Dump1090 is a lightweight command line Windows and Linux based Mode S ADS-B decoder. It also has a built in web service which can display the decoded aircraft positions on Google maps. Many people report that dump1090 has the best decoding performance. Decodes UAT, which is similar to ADS-B, but more commonly used by light aircraft. An ADS-B decoder similar to dump1090, with built in web interface and Google maps interface. Also has a Google Earth interface. Link is in Russian, see the Related Post for extra info about compilation. A multiplatform command line based ADS-B Mode S and Mode A/C decoder for the RTL-SDR. Can feed Basestation natively without the need for com port converters. Can also decode Mode S and mode A/C simultaneously. Cocoa1090 is a Mac based Mode S ADS-B decoder. It connects to the RTL-SDR via rtl_tcp. 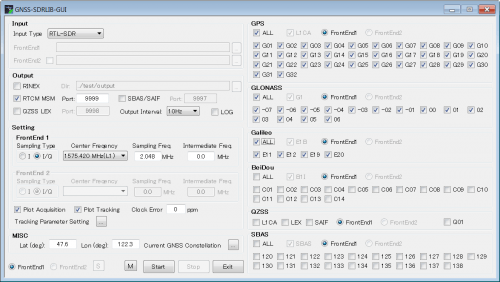 gr-air-modes is a GNU Radio based program which performs Mode S ADS-B decoding. ADS-B on USB SDR RTL is an Android app that can help receive, decode and display on a map ADS-B aircraft positions with the RTL-SDR. Now also supports decoding of NEXRAD weather data. 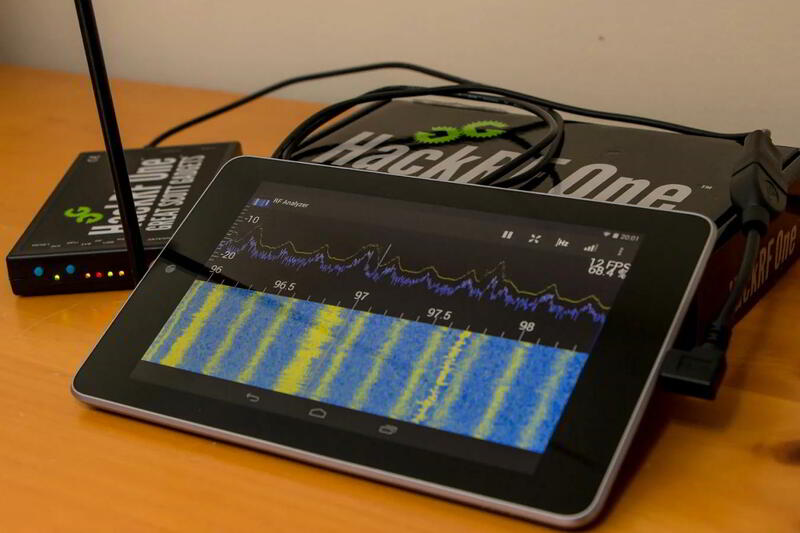 To run this program you will need an Android 4.0+ device with a decent processor, a USB OTG cable and an RTL-SDR dongle. PiAware is software for the Raspberry Pi which allows data coming from dump1090 to be shared with the FlightAware.com public servers. An Android app that not only decodes ADS-B data, but also plots it on a map and shares the data with the FlightAware network. 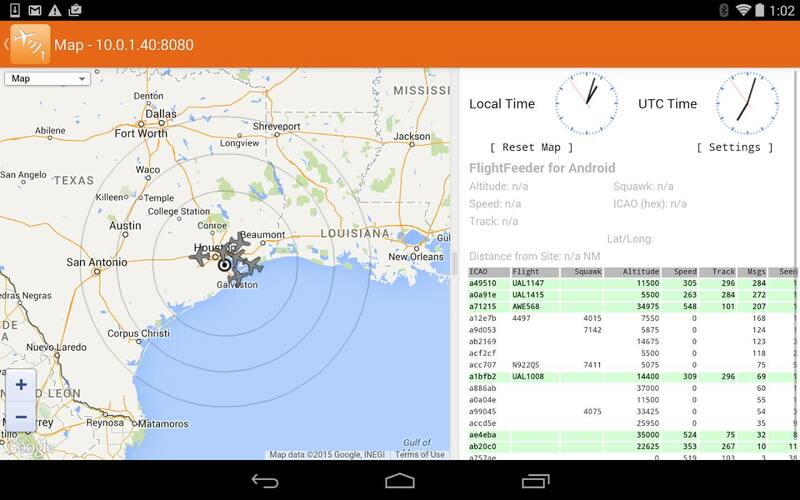 Android based ADS-B decoder with offline maps for Europe. A decoder for FLARM, a protocol similar to ADS-B but used for smaller aircraft like gliders and helicopters. 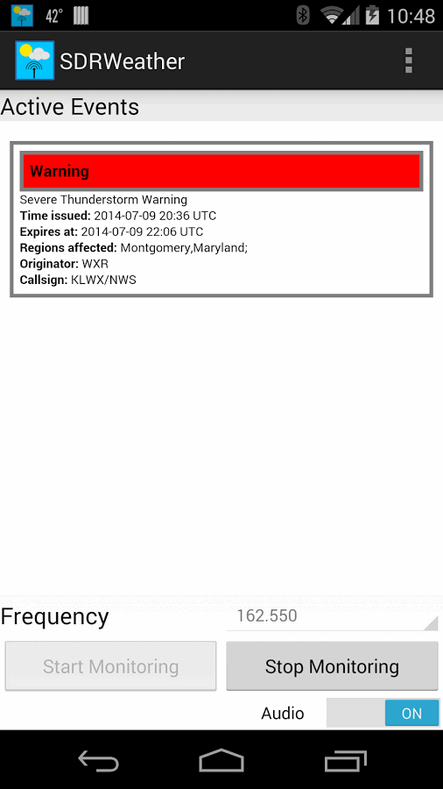 An Android app for listening to weather radio in the US and Canada. 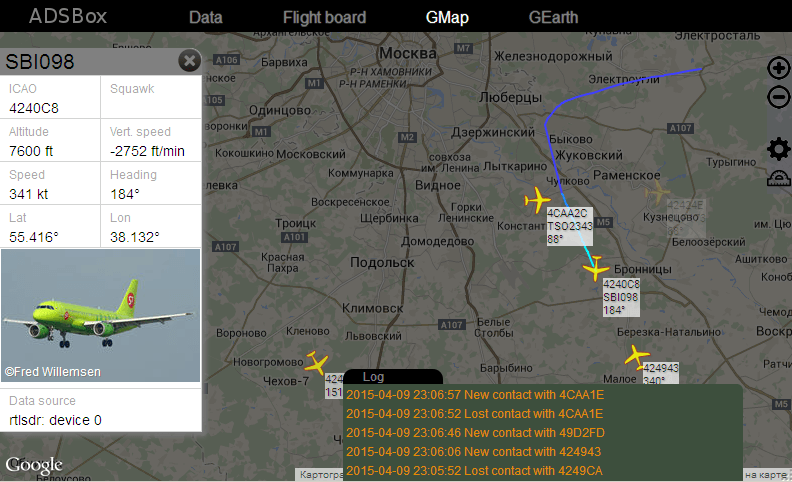 Can also decode EAS alerts. To run this program you will need an Android 4.0+ device with a decent processor, a USB OTG cable and an RTL-SDR dongle. rtl_acars_ng is an improvement of the old rtl_acars command line based Linux ACARS decoder. It is capable of scanning multiple frequencies and has a built in airline database. See this post for some more information. Acarsdec is a mulithreaded, multi channel (up to four simultaneous channels can be monitored) ACARS decoder with error detection. Software that connects directly to the RTL-SDR and decodes AIS data. Outputs NMEA data via UDP. Appears to be a very good AIS decoder. Note that website is in Chinese. Another AIS decoder that combines rtl_fm and aisdecoder into a single command line program. Currently the AIS decoder that we recommend using. A program that allows you to decode EAS/SAME (Emergency Alert System/Specific Area Message Encoding) alert messages. TVSharp is a simple analogue PAL/NTSC TV decoder. Due to the RTL-SDRs limited bandwidth in SDR mode it is only capable of decoding black and white images. Unitrunker is a trunking control channel decoder and controller. It can be used in conjuction with general purpose SDR receiver software like SDR#, or the latest preview version can be used directly with the RTL-SDR. Unitrunker listens to a control channel, and then can correctly tune SDR# (via a plugin), or itself in the preview version to the correct channel in order to successfully follow a trunked voice conversation. A trunking control channel decoder and controller. Supports most Motorola systems. Can connect directly to the RTL-SDR. 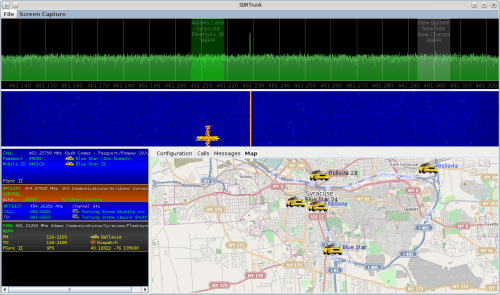 SDRTrunk is a java based application for decoding and trunk tracking multiple analog and digital radio channels across multiple USB dongle tuners and/or sound card inputs from discriminator-tapped scanner radios. A decoder for the NRF905 tranceiver. A decoder for the NRF24-BTLE tranceiver. This protocol is used by many common devices such as mice and keyboards. A program to decode temperature sensors on the 433 MHz ISM band. A program to decode data sent by Elster R2S smart meters. A command line program that allows the decoding of EnergyCount 3000 energy loggers. A command line program for decoding smart meters on the 900 MHz ISM band. 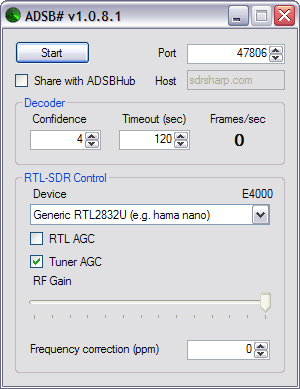 A translation server which allows the RTL-SDR to be used on HPSDR specific software. An upgraded version of Airprobe. An upgraded version of gr-gsm that can also connect and control a test mobile phone. rtl_entropy is a command line Linux program which uses the RTL-SDR as an entropy (randomness) source. GNU Radio based AIS decoder which can decode both AIS channels simultaneously. 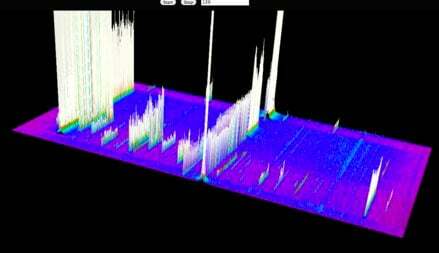 A GPU accelerated spectrum viewer. ViewRF is software that displays a FFT RF display on a BeagleBone Black mini computer. rtl_power is a wideband spectrum monitor. This tool let’s you gather signal data over a very wide area of the frequency spectrum, and then that data can be used to find active areas of the spectrum. A modified version of rtl_power that uses more efficient FFT processing libraries. Similar to rtl_power but designed for radio astronomy use. Kalibrate-rtl is a command line Linux tool that is used to determine an RTL-SDR dongles frequency offset in PPM. It uses the time synchronization information in GSM signals to do this. An APRS-IS gateway which supports the RTL-SDR. A simple waterfall display for the RTL-SDR. A collection of tools to locate and track LTE basestation cells which supports the RTL-SDR. A fork of LTE-Scanner which supports decoding of Time Division LTE (TD-LTE) signals. A tool for decoding the FS20 protocol which is used in home automation. LibRedio is a tool which can decode temperature and humidity readings that are broadcast from many commercially available wireless environmental sensors. PureData and Max/MSP are graphical programming tools for creating music, sound, video and interactive graphics applications. This software is a wrapper for RTL-SDR that allows the dongle to be used in these tools. A On-Off Keying (OOK) decoder for radio data commonly found in the 433 MHz ISM band. RTL Bridge allows a connection between the RTL-SDR dongle and the Radio-SkyPipe and Radio-Sky Spectrograph radio astronomy software. Software for the Chrome browser that allows you to view an RTL-SDR waterfall in 3D. Software for using the RTL-SDR as a cheap noise figure indicator. Requires extra hardware. 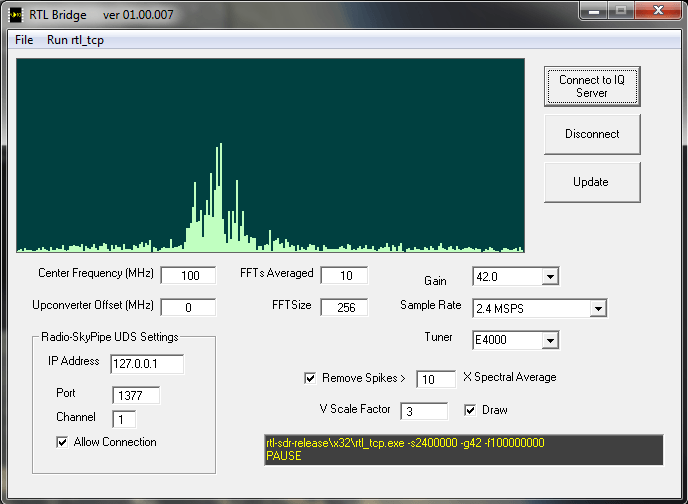 RF Spectrum analyser software. Pro version unlocks extra features such as recording/playback mode, zoom, topographic maps and logging. Software that allows you to decode up to eight airband channels simultaneously and stream them to online services like liveatc.net. A Mac only app that can receive data from Oregon Scientific weather temperature sensors. 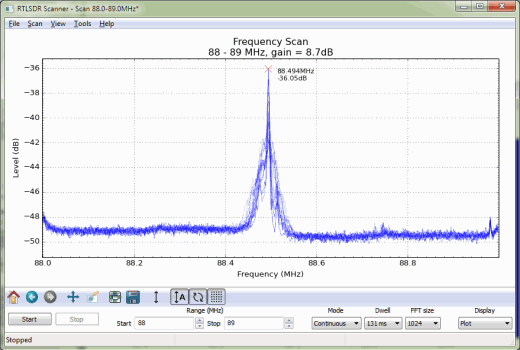 Freqwatch makes use of rtl_power to scan a wide swath of RF spectrum and then automatically records and stores in a database sound files of active signals by using rtl_fm. Runs a server which broadcasts audio from an RTL-SDR. 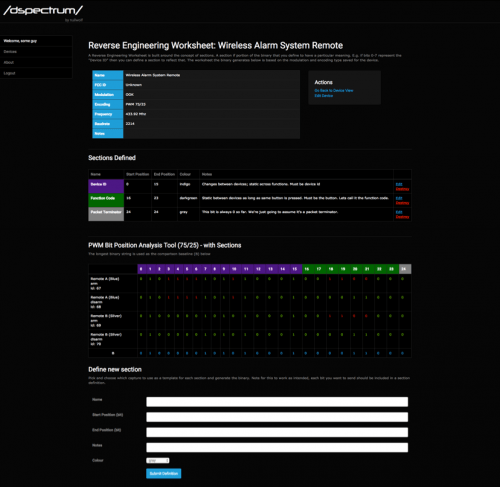 Has a web interface which allows for remote control of the server. 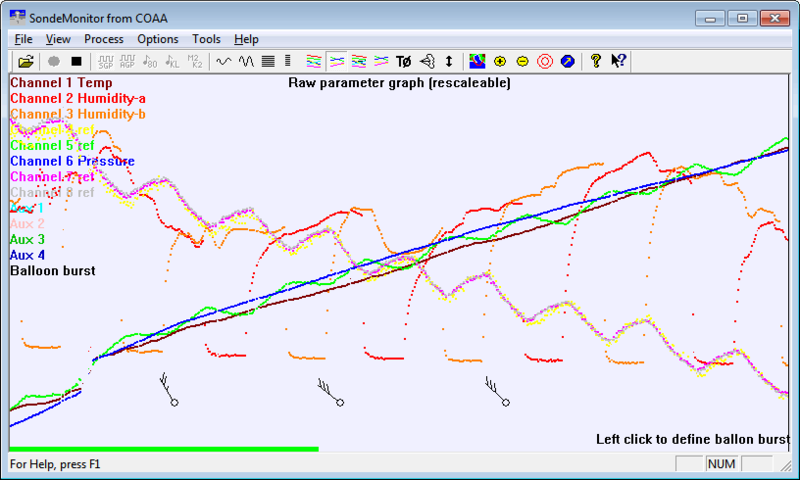 Allows you to visualise the FFT in various 3D modes. 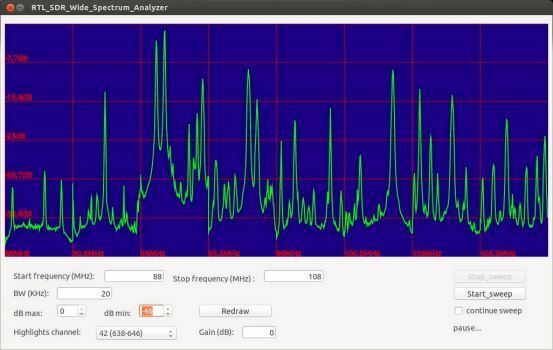 A Python based spectrum analyser rtl_power GUI. Tested on Linux but may work on Windows and OSX too. A command line utility for decoding Radio Data System (RDS). Uses rtl_fm. Helps to pinpoint RF noise by driving around with several RTL-SDR dongles. 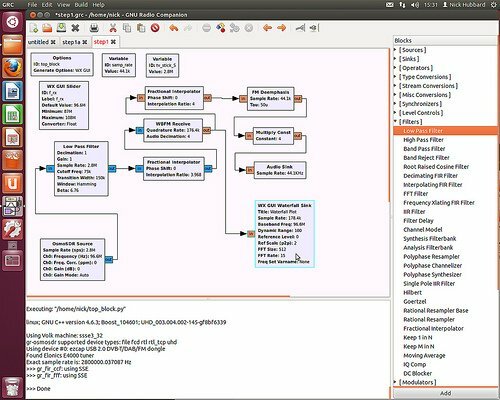 Sigmira is a free software program that is capable of decoding a wide range of ham radio signals. Sigmira is best known for it's support for decoding the "Japanese Navy Slot Machine" signal and STANAG4285 signals. Newer versions of Sigmira can interface directly with the RTL-SDR, or use in conjunction with a general purpose SDR receiver and pipe the audio output to Sigmira. Unlike conventional radio scanners that lock and demodulate a single channel, this SDR scanner can demodulate and record audio from N channels in parallel within the digitizing bandwidth. The N (number of) channels is basically just limited by processor speed. This program runs on a Raspberry Pi and allows you to use the Raspberry Pi's data pins as a crude transmitter. At the same time it also interfaces with an RTL-SDR dongle to act as a receiver. A 1-seg ISDBT receiver for the RTL-SDR. Runs via GNU Radio. 1-seg and ISDB-T is commonly used on things like TV for small devices like mobile phones. 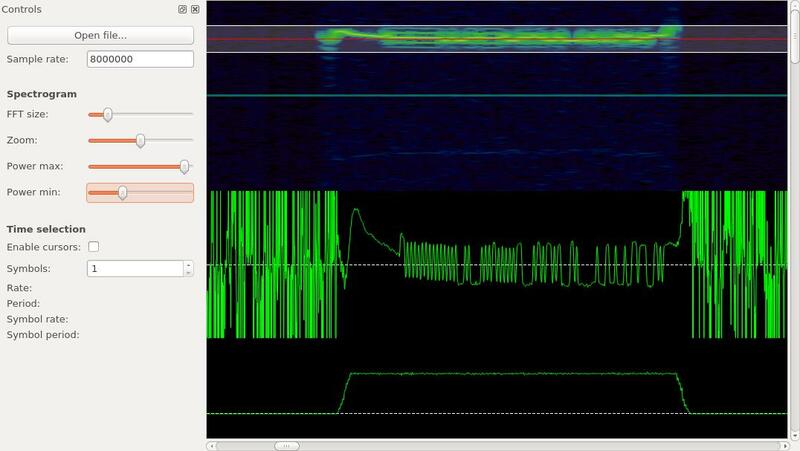 Telive is a program that can be used to decode TETRA digital voice signals. It is available for Linux, and there is also a Windows port now available. See the related post for a tutorial on setting it up. Another TETRA decoder. Isn't as popular as telive, probably due to the requirement that it requires Vagrant which seems to need a licence. A decoder for Iridium satellites. Can currently decode calls and some short messages. Difficult to set up and use, a more advanced project. A network streaming server compatible with RTL-SDR dongles. Similar to rtl_tcp but much more efficient as it only streams the selected IF. 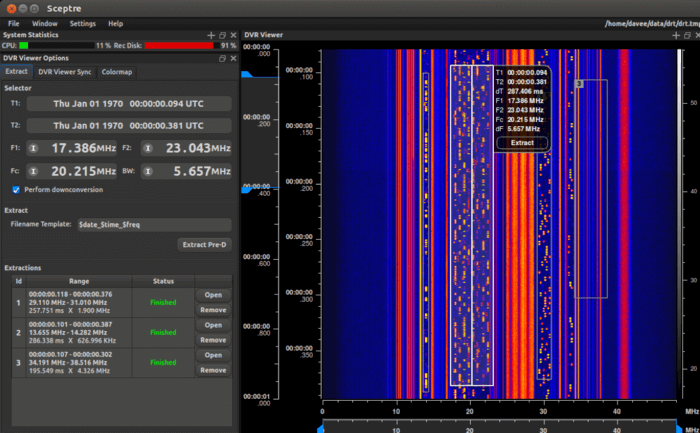 A program that can be used with two RTL-SDR dongles that share the same clock for passive radar detection. Can be used to supposedly detect ghosts and spirits via the Electronic Voice Phenomenon (EVP). Basically quickly tunes the RTL-SDR between various broadcast FM stations and you're supposed to hear voices from ghosts. An AIS decoder and mapping app for Android. A tool that turns an RTL-SDR into a microphone base stations for events. 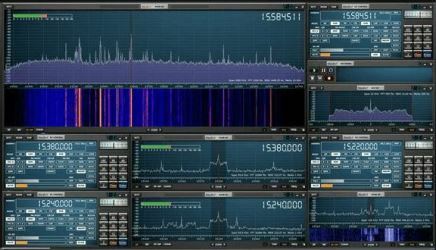 'The Standard Library' is a set of tools and demodulators for software defined radio like the RTL-SDR. The main program is MultiFM which allows you to monitor multiple FM channels at once. tsl-sdr also comes with a pager decoder. A lightweight command line based VDL2 decoder. A GNU Radio based DECT decoder. The DECT protocol is commonly used on modern digital cordless phones. An Android app for using the RTL-SDR as a standard DVB-T decoder. A decoder for the HD Radio signal found in the USA. This is a digital FM radio broadcasting signal that can be identified on a RF spectrum as the two solid blocks surrounding a standard wideband FM radio station. The protocol is closed sourced, but the author of NRSC5 managed to reverse engineer it and create a decoder. A simple Python scipt that works with gr-gsm for collecting IMSI numbers on cell phones spotted. A decoder for the blockstream project. This is a project that tries to beam down the bitcoin block chain from a satellite, with an RTL-SDR used as the receiver. See the related post for further information. A simple program that aims to detect wireless bugs based on the strength of the signal emitted by the bug. GNU Radio based decoders and encoders for digital speech modes such as Codec and Opus. An expensive but highly sophicated signal processing suite with various advanced decoders and analysis tools. Aimed towards military and professional SIGINT users, but also supports the RTL-SDR. Under this heading we list RTL-SDR software that is mainly intended for education and research purposes. GNU Radio is a powerful digital signal processing (DSP) package for creating software defined radios. DSP programs can be written visually using block diagrams in the GNU Radio Companion software. It supports the RTL-SDR with an RTL2832U source block. Various decoders are written in GNU Radio and require it to be installed to run. MATLAB is a well known mathematical computing language. With this support package MATLAB can interface with the RTL-SDR, and digital signal processing algorithm can then be written in MATLAB. LabVIEW is a software package usually used for control systems engineering. With SDR Lab, the RTL-SDR is able to interface with LabVIEW. 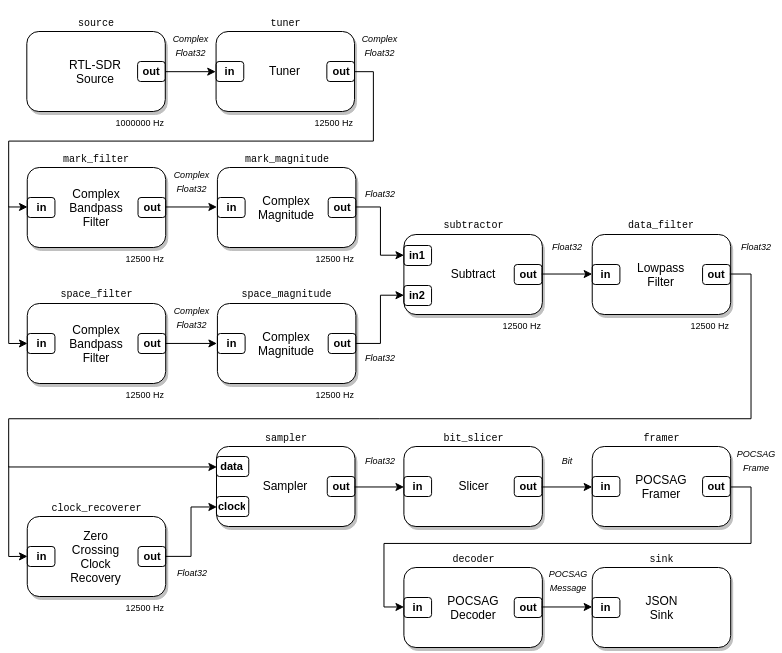 A LuaRadio based POCSAG decoder flowgraph. A visual block based DSP framework kind of similar to GNU Radio but based in LUA. It's main advantage is that it claims to be extremely lightweight. These programs do not directly access the RTL-SDR but are compatible with the RTL-SDR either through piping of the audio output via software like VBCable, Virtual Audio Cable, Windows Stereo Mix, Linux pipes or a physical Audio Cable or via receiving RTL-SDR received data through some other way such as through a network. Most of these are general ham radio programs that have found wider use with the RTL-SDR. WxToImg to a program which can be used to decode NOAA weather satellite data and then display and post process the weather images. Use in conjunction with a general purpose SDR receiver and pipe the audio output to WxToIMG. PDW is a POCSAG/Flex pager decoding program. Use in conjunction with a general purpose SDR receiver and pipe the audio output to PDW. DSD is an acronym for digital speech decoder. It is a program that is capable of decoding digital speech codecs such as P25, DMR/MOTOTRBO, NXDN and D-Star. DSD+ is a new version of DSD which has the same features as DSD, but has improved decoding performance. For DSD you will need to copy cygwin.dll into the same direction as dsd to run the program. For DSD+ you won't need cygwin, but instead you will need lame_enc.dll. Use in conjunction with a general purpose SDR receiver and pipe the audio output to DSD/DSD+. There is now also the in development DSD 1.7 which supports new features like D-Star voice decoding. DREAM is a Digital Radio Monodiale (DRM) decoder. You will need an upconverter to receive DRM signals with the RTL-SDR as they are on the HF band. To use DREAM you'll need to also compile or download an AAC decoder dll file, see our tutorial for a pre-made .dll. Use in conjunction with a general purpose SDR receiver and pipe the audio output to DREAM. 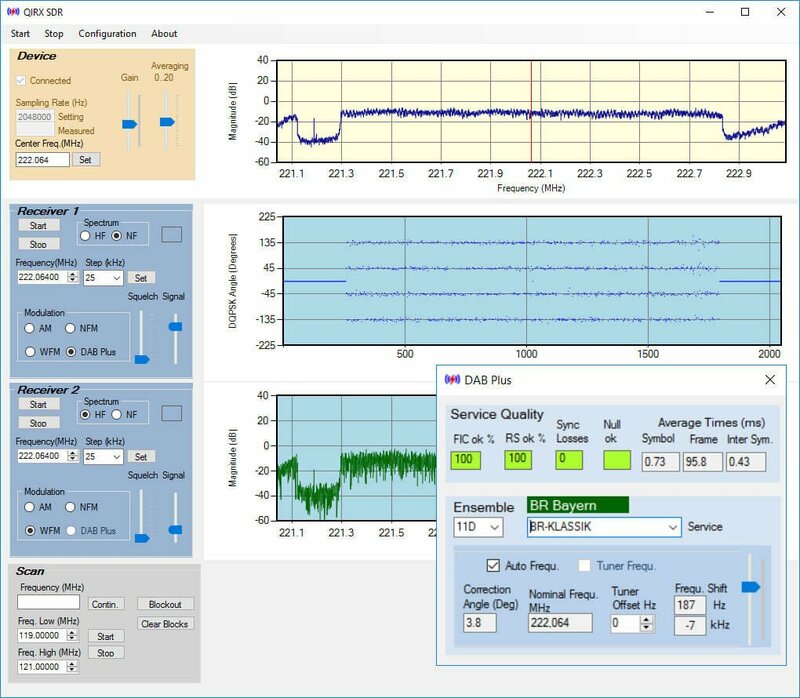 SondeMonitor is commercial software with a 21 day free trial that is used to decode various weather balloon (radiosonde) telemetry signals. Use in conjunction with a general purpose SDR receiver and pipe the audio output to SondeMonitor. A free radiosonde decoder. Command line based and supports most common radiosonde protocols. A modification of fldigi that can receive telemetry from amateur high altitude balloons (HABs). Use in conjunction with a general purpose SDR receiver and pipe the audio output to dl-fldigi. 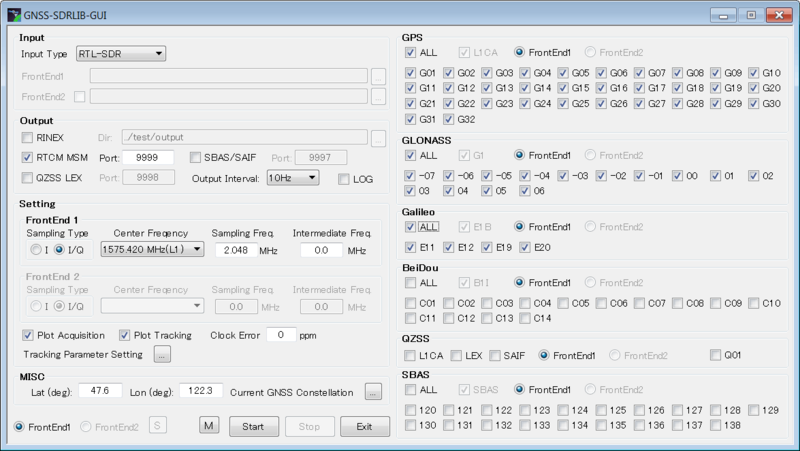 PlanePlotter is a commercial advanced graphical ADS-B radar display with a 21 day free trial. With the RTL-SDR, use in conjunction with an ADS-B decoder. PlanePlotter also has an excellent ACARS decoder. To use the ACARS decoder, use with a general purpose SDR receiver and pipe the audio output to PlanePlotter. 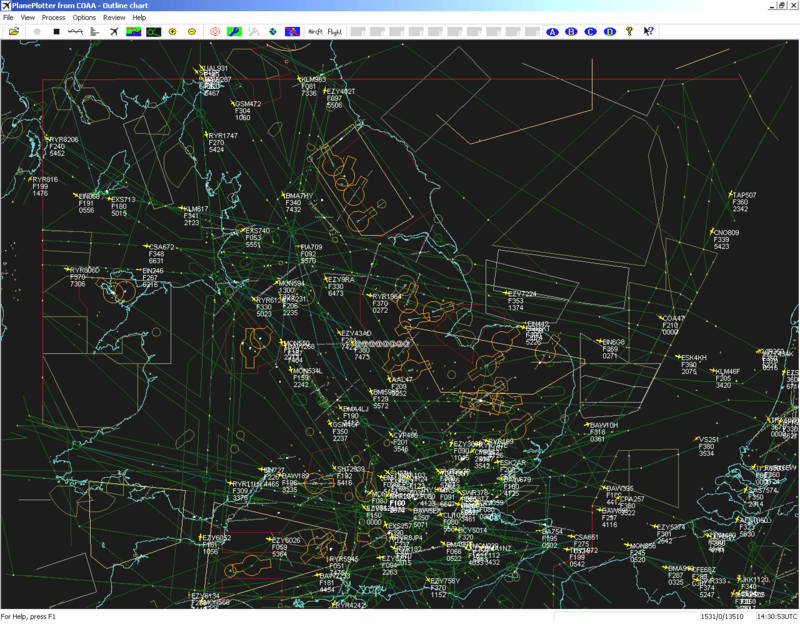 GlobeS is a simple lightweight graphical ADS-B radar display. With the RTL-SDR, use in conjunction with an ADS-B decoder. 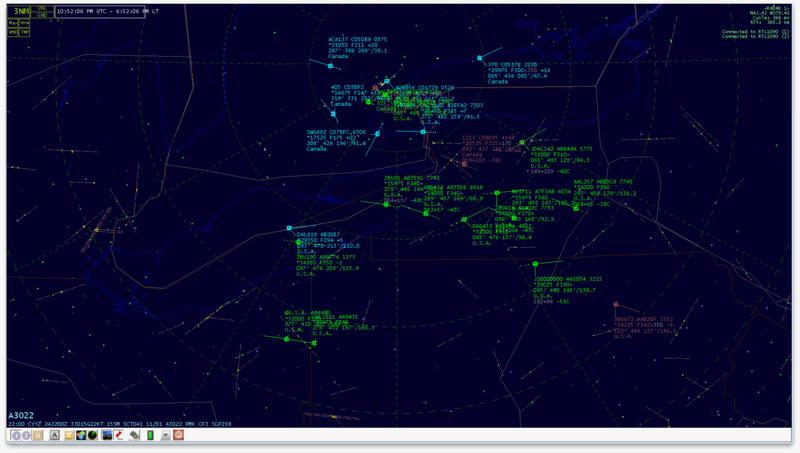 adsbSCOPE is a graphical ADS-B radar display. With the RTL-SDR, use in conjunction with an ADS-B decoder. 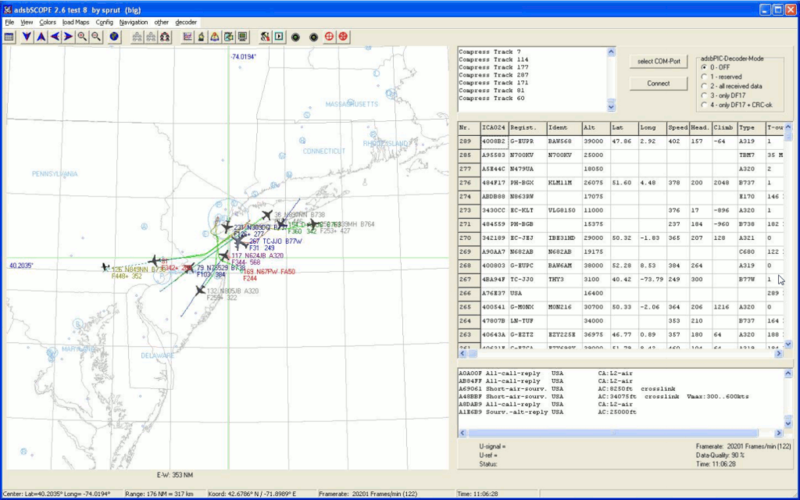 Virtual Radar Server is a free program which will display ADS-B data on a Google Maps window. With the RTL-SDR, use in conjunction with an ADS-B decoder. 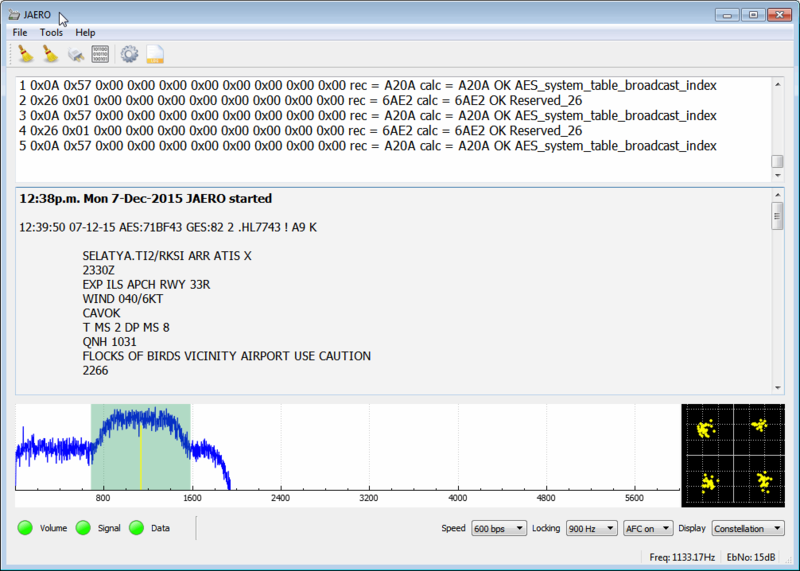 Acarsd is a free ACARS decoder program. It contains a database of aircraft and will display their images if they exist. Use in conjunction with a general purpose SDR receiver and pipe the audio output to Acarsd. ShipPlotter is a commercial program which can plot ship positions on a nautical map or Google maps from decoded AIS datastreams. It has a 21-day free trial. Use in conjunction with a general purpose SDR receiver and pipe the audio output to ShipPlotter. AISMon is a free AIS data decoder. It can output decoded AIS data through a UDP stream for use in other programs that display the ship positional data such an OpenCPN. Use in conjunction with a general purpose SDR receiver and pipe the audio output to ShipPlotter. OpenCPN is a free nautical AIS mapping tool which can display ship positions on a map using AIS data. Use this software in conjunction with a program that decodes AIS data, such as AISMon. 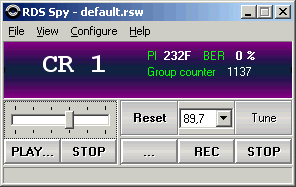 RDS Spy is a free and very sensitive Radio Data System (RDS) decoder. Use in conjunction with a general purpose SDR receiver and pipe the audio output to RDS Spy. Orbitron is a free satellite tracker. With a plugin, Orbitron can be made to control the tuned frequency in SDR# allowing for automatic satellite tracking, and doppler effect correction. Use in conjunction with the Orbitron SDR# plugin. AFSK1200 is an AFSK1200 decoder. This mode is used by APRS radio hobbyists. Use in conjunction with a general purpose SDR receiver and pipe the audio output to AFSK1200. 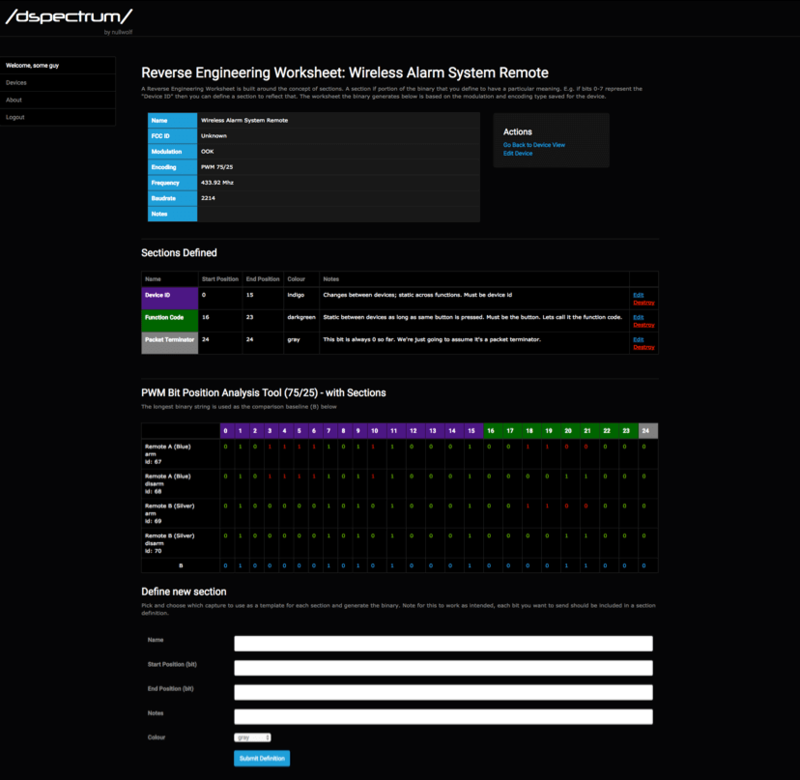 This is a program designed to decode the Funcube satellite telemetry data. Use in conjunction with a general purpose SDR receiver and pipe the audio output to the dashboard. A software GPS receiver code base which supports the RTL-SDR. Another GPS decoder but compatible with Windows. See the related post for a tutorial on its operation. Dstar is an DStar decoder program. Use in conjunction with a general purpose SDR receiver and pipe the audio output to dstar. A general purpose voice services system. Is used to control a repeater tower. Using RTL-SDR's allows you to add extra receiving frequencies to the repeater. 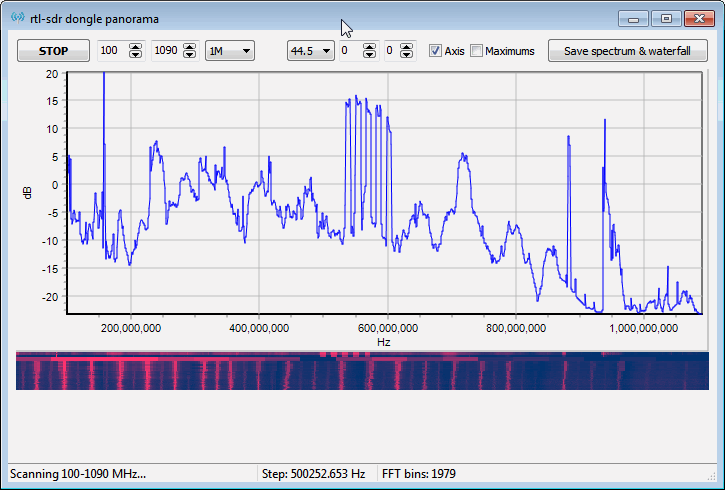 Spectrum Lab is a free specialized audio analyzer, filter, frequency converter, hum filter, data logger. It is usually used in the field of radio astronomy for things like meteor detection. Use in conjunction with a general purpose SDR receiver and pipe the audio output to Spectrum Lab. 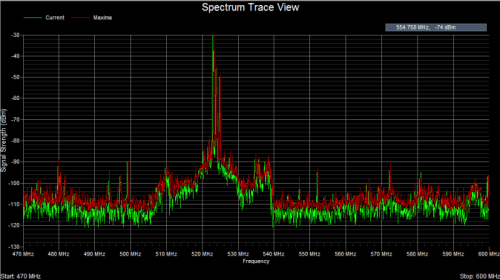 Baudline is a free audio spectrum analyzer usually used to analyze radio data signals. Use in conjunction with a general purpose SDR receiver and pipe the audio output to Baudline. 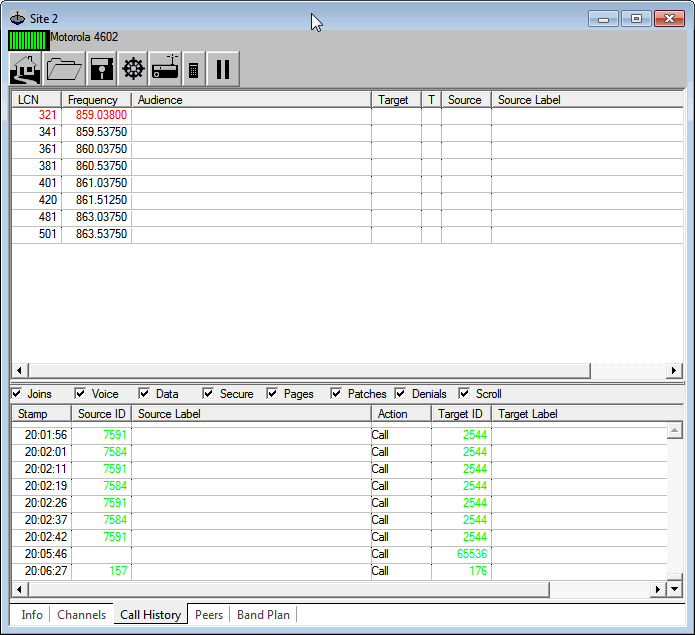 HROFFT is a specialized audio analysis software program designed for monitoring meteor scatter signals. Use in conjunction with a general purpose SDR receiver and pipe the audio output to HROFFT. multiPSK is a popular ham digital mode decoder and supports a very wide range of digital modes. It also directly supports connecting to the RTL-SDR via RTL_TCP.exe. You will need to download the rtlsdr official Windows release, and copy the rtl_tcp.exe, rtlsdr.dll, pthreadVC2-w64.dll and libusb-1.0.dll into the same directory as multipsk.exe to use this option. 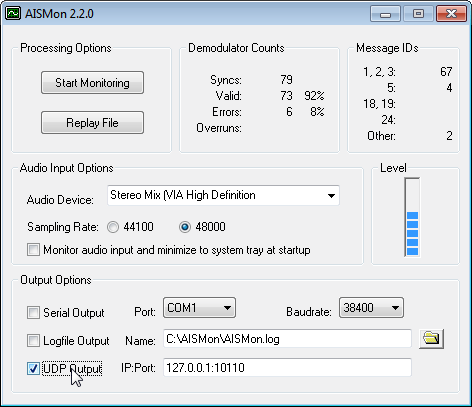 Otherwise you can simply pipe the audio from a general purpose SDR receiver into multiPSK. 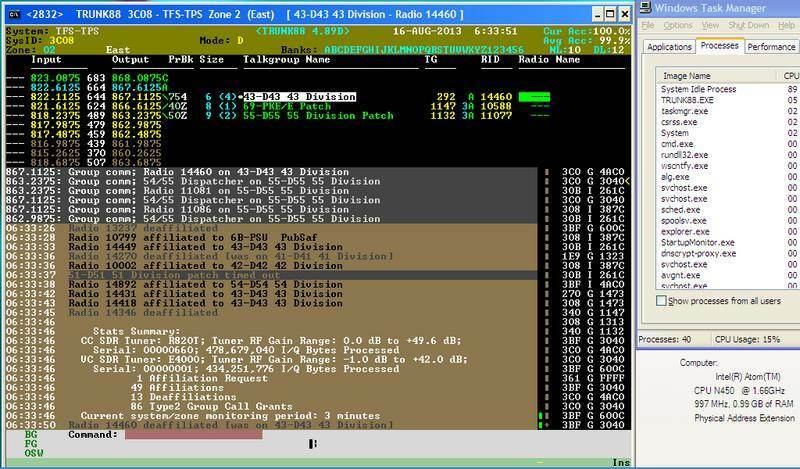 Fldigi is a free software program capable of decoding various ham radio digital data signals such as CW, Contestia, Domino, Feld Hell, Olivia, MT63, PSK, RTTY, Thor and WEFAX. Use in conjunction with a general purpose SDR receiver and pipe the audio output to Fldigi. multimonNG is a fork of the multimon software. It is a general purpose decoder capable of decoding POCSAG512, POCSAG1200, POCSAG2400, EAS, UFSK1200, CLIPFSK, AFSK1200, AFSK2400, AFSK2400_2, AFSK2400_3, HAPN4800, FSK9600, DTMF and ZVEI. Use in conjunction with a general purpose SDR receiver and pipe the audio output to MixW. 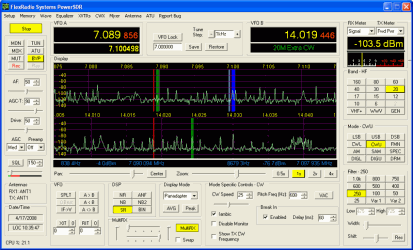 MixW is a free software program used for decoding various digital ham radio signals. It is capable of decoding CW, BPSK31, QPSK31, FSK31, RTTY, Packet, Pactor, Amtor, MFSK, Throb, MT63, Hellschreiber, WEFAX and SSTV. Use in conjunction with a general purpose SDR receiver and pipe the audio output to MixW. 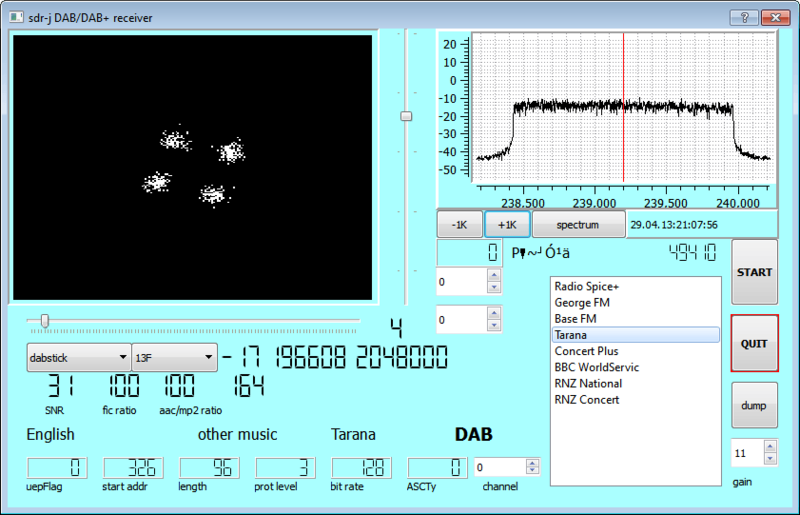 Sorcerer is a free software program capable of decoding a wide range of ham radio signals. 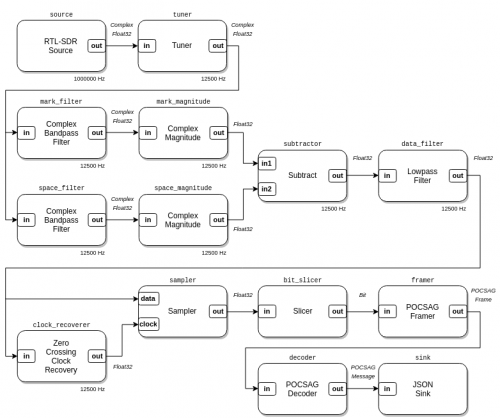 Sorcerer is known for its decoder support for rarely used signals, but it is mostly used to decode STANAG 4285 signals. Use in conjunction with a general purpose SDR receiver and pipe the audio output to Sorcerer. Rivet is a free open source decoder for various spy agency and numbers station related HF signals such as Baudot, CCIR493-4, CIS36-50, CROWD36, FSK200/500, FSK200/1000, FSK, GW FSK, XPA and XPA2. DMRDecode is a free open source DMR decoder which currently only displays DMR frames in text. CWSkimmer is a Morse code (CW) decoder. It is generally regarded as one of the best CW decoders available. Use in conjunction with a general purpose SDR receiver and pipe the audio output to CWSkimmer. MMSSTV is a dedicated SSTV decoder program. Taxidecoder is a free mobile data terminal (MDT) decoder. It will only work in countries that use MDT data signals that taxi decoder supports. Use in conjunction with a general purpose SDR receiver and pipe the audio output to taxidecoder. A PHP based web server program which can be used to record, log and analyze trunked radio traffic. Used to analyze trunked LTR signals. Can be used to decode end of train, head of train and distributed power unit telemetry which is used on some trains. Linux software that allows you to visualize APRS signals on a map. 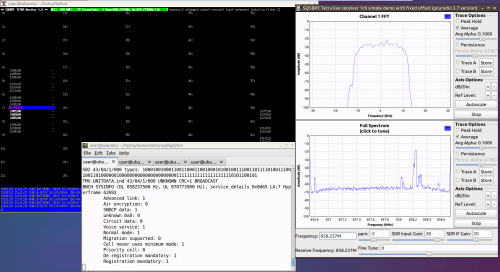 Allows RTL1090 to interface with XHSI, a program that can emulate airplane flight instruments. Decodes data from the Russian Parus military communications and navigation satellites. Creates a 3D image of ADS-B data from dump1090 using MATLAB. 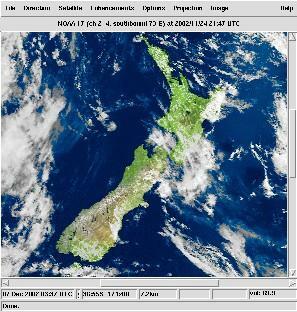 Decodes LRPT weather satellite images. Used for recording audio from an SDR with squelch feature that stops recording when there is no sound. A linux script that helps automate I/Q recordins. Two Linux based programs which work with the piped output of rtl_sdr to correct for satellite doppler shift and to also demodulate FM. Create a heatmap image from an rtl_power scan. Can be used to render a nice heat map from an rtl_power scan. 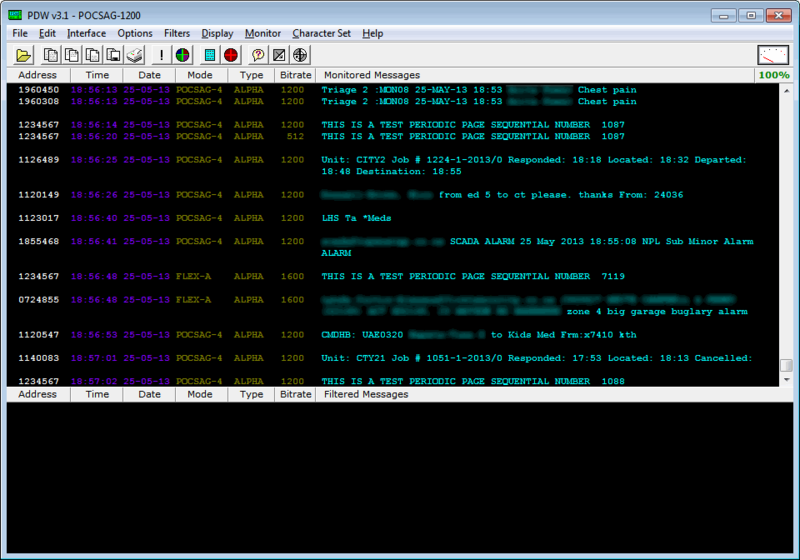 Allows decoding of Inmarsat STD-C EGC messages. Software that allows you to visualize the output of a rtl_power scan using a generated waterfall image in a web browser. Shows the current frequency and time wherever the mouse is. Can be used to decode AERO signals from Inmarsat satellites. AERO is similar to ACARS but sent via satellite communications. A tool very useful for reverse engineering digital signals. Helps you extra the binary string and timing information. An upgrade to Inspectrum which gives it a GUI and more visual decoding features. Extremely useful for reverse engineering digital signals. Not something you use via piping, but has can be useful for making timelapse waterfall recordings when a program does not have that feature by default. See the related post for more info. A tool for converting rtl_power scans in csv format into a nice HTML based waterfall graph. Also takes data from sigidwiki.com and overlays it on top of the waterfall. A tool somewhat similar but a bit more advanced to Inspectrum for reverse engineering digital radio signals. A decoder for ATCS signals that come from trains. Can be used to track train track status and positions of trains. Compatible with the signals used in the USA. Note that to download the software you will need to join the ATCS Monitor Yahoo! Group. A lightweight DVB-S decoder for receiving Digital Amateur TV like HamTV from the International Space Station. Can also be used to decode the L-band Outernet signal. A simple program to deinvert analog radio signals scrambled with voice inversion scrambling. The Hobbyist's Guide to the RTL-SDR: Really Cheap Software Defined radio. April 7, 2019 - 3:21 am Michael C.
Thank you for the list. I noticed that the link for Trunk88 no longer works, and it does not seem to be an active project any longer. For Unitrunker, it would be helpful to link to the Version 2 site as well (http://www.unitrunker.com/v2/). Is there any SCA Decoder windows software for RTL-SDR? 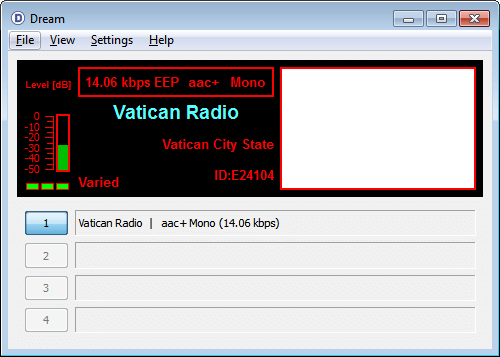 Are there any Windows Based programs that work with a RTL2832 like Winradio? I have a Broadcastify feed using Winradio but the receiver burned out. I would like to use a NooElec NESDR Mini 2 USB Stick to feed Broadcastify from the Windows 10 computer. I have it working under a Raspberri Pi but need it to work with Windows. Please place on this site link to Zeus Linux version. On official producer site is only .msi file. I buy V3,use zadig install driver on windows 10,after i reboot,there will no driver,then should run zadig again and install driver,how to reslove this prorblem?thanks. 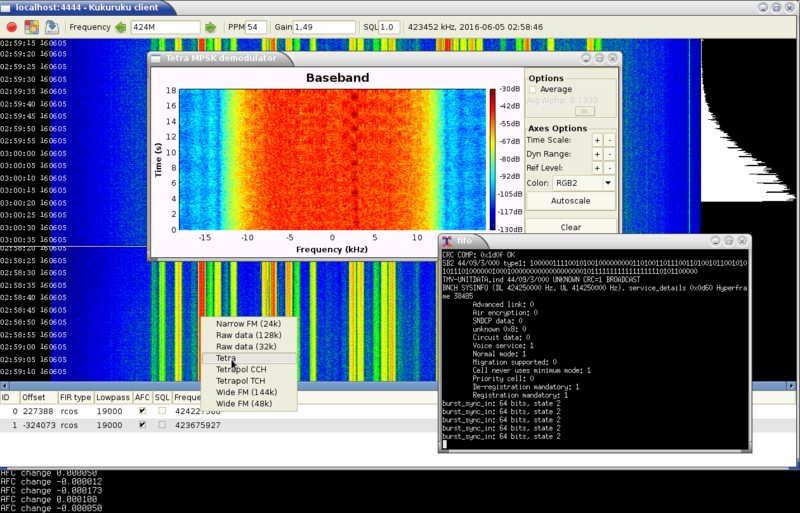 Written in Python, works with most available devices, comprehensive feature set, relies on GnuRadio for its back-end. an app for meteor scatter purposes. Opensource. Supports Windows, Linux, Raspberry PI. They decompiled SDR#, since it is a JIT compiled language, totally ignored the licensing and then created a new GUI – not really new at all. You have a great website and I have mentioned it several times on my YouTube channel, hamrad88 but I wish you would update the listing of software for the SDRs. Could you please add QRadiolink (http://qradiolink.org) to the list of Linux software? Just got my RTL-SDR! 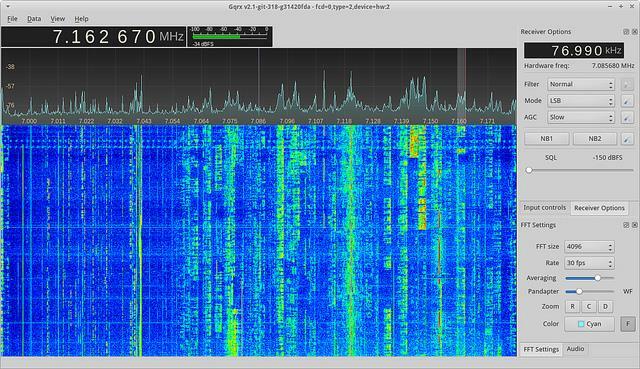 Installed HDSDR v2.76 according to the instructions here at RTL-SDR.com. I found support for bias-T and direct mode, through the ExtIO button. I need a faster computer to be totally happy, but until that happens… This is close enough B-). Received several FM stations 60+km away with a 15 cm wire antenna! I just started playing with it. https://github.com/f4exb/sdrangel is one of the most advanced general purpose SDR programs. It’s free, open source and has regular releases for Windows and Linux. a vdl mode 2 RTL SDR decoder. Decode vdlm2 acars and XID. It would be really useful for this (or future) lists if you could mention whether the software is open source or not. As a hacker, I want something I can modify! And having tried it… I purchased it… And it works great! Simple and efficient. 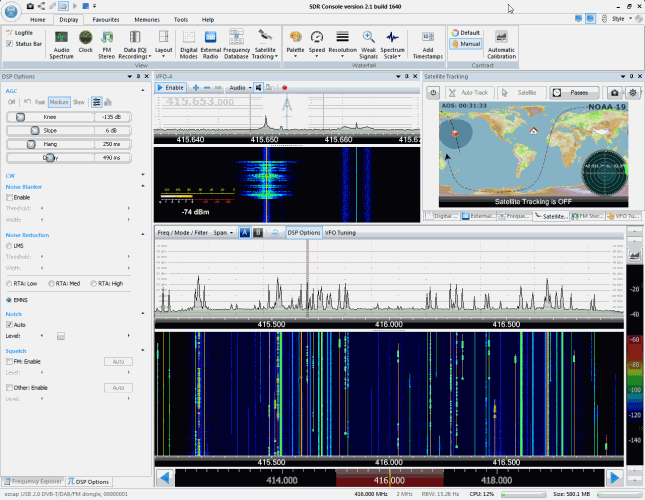 SdrDx is a great application. Works on Mac and PC. The ZZIP file for SDR-Radio.com contains a Trojan. Nortons AV freaks out and kills the executable! The report claims that Trojan.Gen.8 (discovered 12/2016) is contained in the executable..
GQRX doesn’t work with the RTL-SDR device either. No option for RTL2838. oh yes it does – make sure you have gnuradio installed as well. The QtRadio instructions for Ubuntu 16.04 don’t work and there’s no way to contact the people who run that site. All repos are available but it cannot find any of the required packages. did you do an apt-get & install for the library files – you may also need to power the dongle from a hub, not directly for your Pi. This was an excellent list but a lot has changed since this was published or last updated. Would love to see an update or if anyone knows of a similar list that is more up to date, I would appreciate hearing from you. Hello, everyone, just starting to decide on my first SDR to purchase. I’ve been a lifelong Shortwave listener, and own a Grundig Satellit 800. 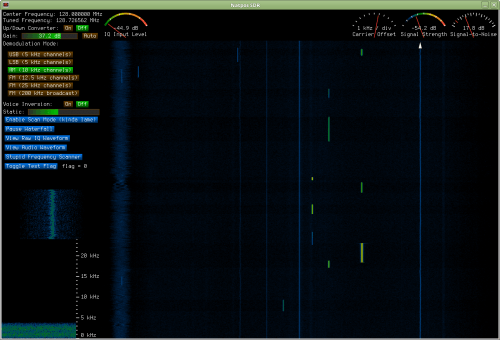 I have a Mac and have downloaded GQRX and HDSDR – now to order the hardware! xwxapt is a GTK+ graphical application for decoding and saving weather images transmitted in the APT format of NOAA and METEOR satellites. Works direct from sound card or RTL-SDR.